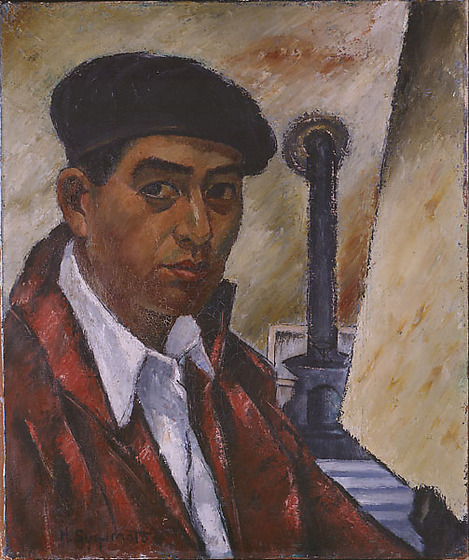 Self portrait of Henry Sugimoto. Artist has depicted himself in Â¥ profile, at left, with a blank canvas in front of him on an easel, at right. A potbelly stove is visible between the two in the background. Sugimoto wears a black beret and a red jacket with collar up over a white shirt. He gazes out directly at viewer. Signed in medium, bottom left: H. Sugimoto. 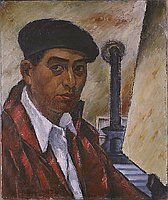 Written on back: Self Portrait/ Painted this portrait 1931/ 1931 / (In Japanese) Pari nite / Henry Sugimoto.